The whales are coming back to the bay, there have already been some sightings of the majestic Humpback Whales by boaties and small plane pilots. Every year these giants of the ocean make their pilgrimage from their Krill rich feeding grounds of Antartic all the way up to the warmer waters of Northern Queensland to their breeding grounds. After giving birth to their young ( some are born in Hervey Bay ) they then start the long journey back to their feeding grounds in the south. This whale migration has become an exciting tourist attraction in Australia. As early as May, one can spot whales swimming and frolicking along the east coast of Australia. These whales have been visiting the waters for years now, taking the route to more temperate waters of Australia for breeding. One of the most famous whales a person can spot during the whale migration season is Migaloo, the all-white humpback whale. Hervey bay is also a great spot as most of the humpback whales from the Great Barrier Reef region stopover for a few days on their return trip, providing a wonderful opportunity for whale enthusiasts. Experts are predicting about 30,000 whales will make the migration up to the breeding grounds of the northern coast of Australia from the Antartic. These gentle giants of the sea are a must to see when you are staying in Hervey Bay with us. 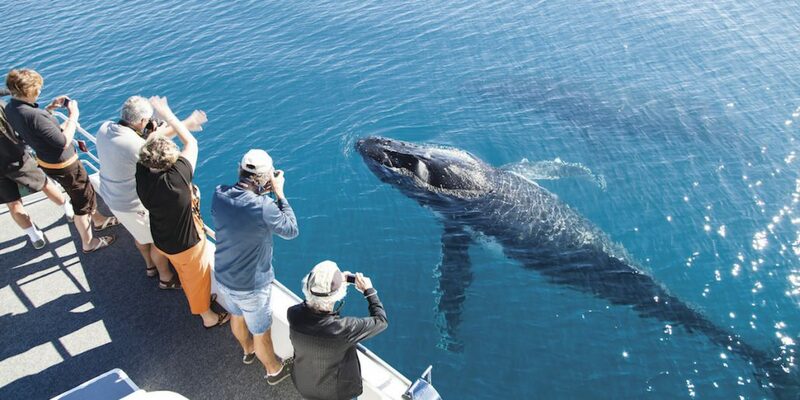 Some Tour boats are now offering a swim with the whales for an encounter of a lifetime. Let the Team at Arlia Sands Apatments advise you on what Tour would be best for you, all Tours cater for special dietary needs and are fully certified. Watch this space for news on all the tours available.